Treewhispers is an ongoing international collaboration awakening our heartfelt connection to trees. Opportunities to participate and connect through the project abound through art and papermaking, performance, storytelling, and site-specific installations. Click on Share Your Story to see how you can participate and BLOG for ongoing information. Trees have a profound impact on our lives. Trees are symbols, resources—inspiration. In remembering our own personal experiences with trees we deepen our appreciation, our awareness, our connection to trees, to the earth and to others. We all have at one time in our life experienced a tree in one way or another. We climbed trees with our friends seeing who could climb the highest, built a tree house that was our refuge, walked through a cool dense forest in the springtime, plucked a ripe red apple off a tree, speculated on what kind of a tree we would be…on a hot summer evening did you run to a tree for safe base when you played tag? Somewhere within you, there is a tree story. Just as the rings of a tree embody the stories of the tree, so too do we carry the stories of trees. These stories inspire us to renew our sense of wonder. They connect us to one another through shared experiences as they deepen our understanding of our connection with nature. Many of us discovered that trees listen quite well and some may even speak to those who listen closely. Treewhispers allows the message to reverberate. How have trees nurtured, calmed, influenced, affected, protected you? Treewhispers was initiated in the year 2000 by artists Pamela Paulsrud and the late Marilyn Sward. The project has been presented in a multitude of venues while gathering round, handmade papers from participants around the world. On the papers, contributors have remembered a tree or the spirit of a tree. Some contributions are simply a magnificent example of beautiful handmade paper and some include text and/or imagery. Some suggest tree rings, depict leaves or illustrate a personally significant tree; others are imprinted with a poem or a meaningful story relating to trees. 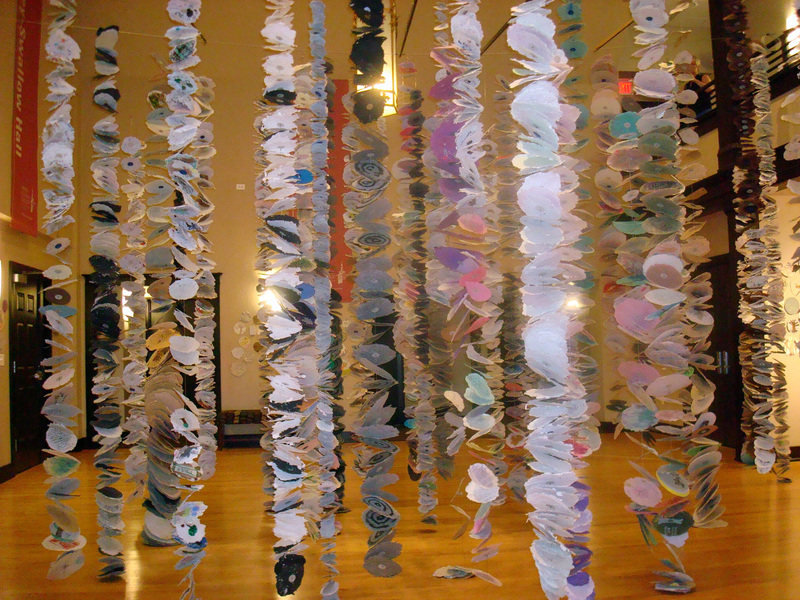 The handmade paper is bound together to create large tree assemblages and ultimately a graceful and peaceful forest of hanging paper rounds for the growing, ever-changing installation. The art of hundreds of participants has been exhibited at colleges, museums, libraries and art centers. It includes the work of professional artists displayed alongside elementary school class projects. * Who can participate? Anyone with a tree story: artists, students, scientists, doctors and dendrologists—elders and wee ones, professional and novice. I’m convinced everyone has a tree story. * What’s the deadline? There is no deadline for the project is ongoing. * Is there a theme? If you haven’t guessed it already, the theme is the tree—your personal stories, art, poetry, experiences relating to a tree in any media on flat, round, handmade paper. For instance, ask yourself the questions: Did you ever climb a tree, plant a tree, have a favorite tree, or name a tree? Share your own personal connection to a tree whatever it may be. Sometimes simple stories are the most profound. * Do I make my own paper rounds? You can or you can collaborate with a papermaker. * How do I make handmade paper at home? Directions for simple papermaking using recycled paper are on the website. Sometimes groups gather for the purpose of papermaking for contributing as a group experience—especially on Arbor Day, Earth Day or Tu B’Shevat. Sometimes home-schoolers or scout troops make paper then gather the tree stories from another generational sector such as parents or grandparents. It’s another chance to be creative. * How many rounds/contributions can I make? You can make one or multiples. It takes many to make a tree! If you do make multiples or have a batch to send, please do not bind them. They will be bound in-house specifically for the installation. * Will they be returned? No, the work becomes the property of Treewhispers and will not be returned. The project is ongoing and the work will travel with the installation. Images of the work may be used for publicity purposes, the website, and catalogs. * How will I know Treewhispers receives them? If you send your e-mail with the work or write to me on the Treewhispers website I will let you know when they arrive. After that, sign up here at the Treewhispers website and stay tuned. * Does the text have to be in English? No. The collaboration is international, so please use your native language. I would highly appreciate an English translation written on the back or on paper in accompaniment with the handmade paper round. * Should I sign my work? It is interesting and fun to see where the work originates and who is contributing but it’s up to you whether you sign it or not. Some work is signed and dated—some on the front—some on the back—some work comes anonymously. * Should I write/draw on one side? Once again, it’s up to you but both sides will be visible so why not use both sides? *Will my work be in the installation? All work that arrives at least a month before the exhibition date meeting the criteria will be included. 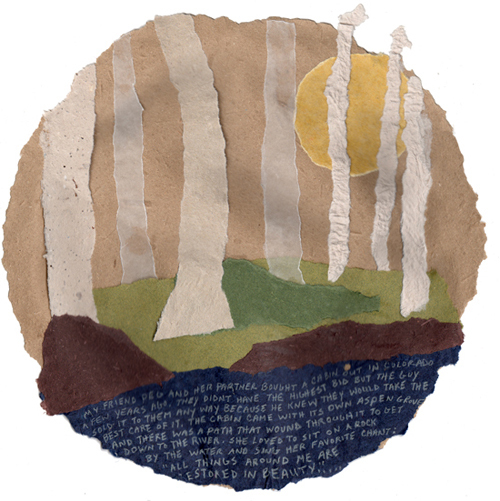 (Criteria being flat, round, handmade paper with a tree story, art, poetry—sometimes the paper speaks for itself.) Work received after that date will be included in the next installation. * How is the “tree”/installation hung? The rounds are strung in-house in roughly 3-8 ft. segments which can be connected together to hang in galleries with varying ceiling heights. This method also serves the purpose to rotate the work from one exhibit to the next. For instance, your work may be near the ceiling in one exhibit and at eye level the next. Also, occasionally some work hangs on the wall. * Where will the installation be next? Please contact Treewhispers for information if you are a gallery or space interested in bringing the Treewhispers installation and or workshops to you. * Is there another way to participate? You can also post your stories, poetry, and photos honoring trees as well as your papermaking process directly here on the Treewhispers.com website or on the Treewhispers Facebook page. Spread the word and stay tuned! YAYYY!!!! Congratulations, Pam, on this beautiful new site for Treeswhispers! I’ll drop by again soon to share a tree story of my own. What a beautiful website! Congratulations. I have started making bowls out of paper and clay mixed together. Hi Kate, Thanks for the post….still figuring this cyberspace stuff out! It would great to see Treewhispers there—I need to check with another gallery as there may be conflicting times…would love to seize such a wonderful opportunity. My friend Kate R. sent me to find you because she knows me so well! How lovely it must be to stand in your forest. Having worked as a member of the Tree City USA in Mapleton, Ia. for 22 years I’ve helped plant over 2500 trees — I find it amazing that you too express the love and meaning and importance of trees. It is said that “the apple doesn’t fall far from the tree.” As your father I am so proud of your many talents that you have conveyed to the world to enjoy. You have touched the lives of so many people with your tree whispers in all the many galleries in which this exhibit has been displayed. Keep up the good works. With Love. Dad. Here is Pamela making the lastest batches of handmade paper for people to put their personal stories on…see more information about the upcoming show on June 9th, featuring a retrospective of the late Marilyn Swards work. there are some days when I go visit the treewhisper web site just so I can read all the love notes…such a gift to the world…and how fab that your dad helped you to learn to share this present. Donna, Thank you for your kind comments and yes, I’ve been richly blessed in the aspect of family, mentors!! I know too that this project, like most that I’m involved with, is a collaborative effort—and am thankful for that connection! This is a beautiful site. Thanks for being. During one of the most beautiful and spectacular autumns in Colorado, for more than a decade, surrounded by the glorious magnificence of our tree friends, I’m sad that I can’t share my love and appreciation for my sister Marilyn right now, with her. awesome it is so beautiful project!!!! LIke your blog. I also have a special feeling for trees and play NA flute. When I moved into this tiny Chicago lot, there were no trees. 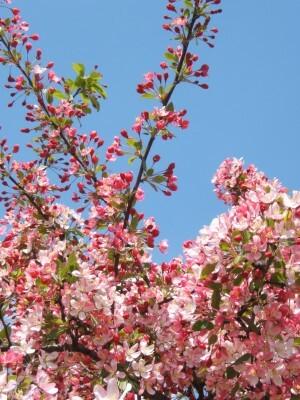 Now there is a cherry, pines, Willows, Popular, Locust and a Scarlet and Japanese Maple among many other plants many I grew from seeds or stick cuttings. I love trees. This afternoon, my mother and I happened upon your exhibition in the botanic gardens. It is an extraordinary energy – all that love in one space! And for trees, which are the antennae of the earth . . . my mother is 82 and can’t do everything she used to do, but she seemed quite interested in making tree rounds. I am visiting from the East Coast, and am leaving too soon to help her make the paper . . . Making paper is a new activity, and she does better right now with the kinds of things she used to do – but drawing and writing “cards” is very apropos of her joys and talents. Is there a way to buy some of the rounds from someone nearby (she lives in Highland Park) so that we could get started right away? I am leaving town on Wednesday, it would be awesome if I could pick up some rounds tomorrow somewhere and begin this process with her. Thanks again for your beautiful and transformative work. Pam, how nice to have met you at the CBG installation – I’ll have to try my hand at paper making so I can add to the work that you have created. It was great fun to experience Treewhispers in person! Interesting site. 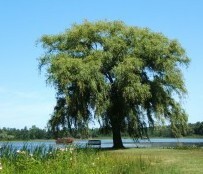 I love trees as much as the next person, but I didn’t really envision a website devoted only to them. You pulled it off. Nice stuff. What a wonderful idea ..Tree Whispers must look great..
Reading all about it in the Letter Arts Review 2012 magazine..
From the New Zealand Calligraphers Aucklands N.Z. What a wonderful site. I’d love to share some of my art with you, based on trees. But I don’t know how to do so. Thank you for your kind comments.I wanted to suggest that often the rounds are displayed on a wall or corkboard prior to sending. If you would like to string them please let me know and for a small fee for shipping and handling I’ll send along the materials and directions. Essentially they’re strung on bookbinding thread with a small disc and beadclasp to support the fragile work. Looking forward to seeing the new paper rounds from your Pre K classroom! Greetings and thank you for your kind comments. If you would like to send your art on handmade paper rounds or type in a story, directions are here. If you would like to send images of trees or artwork relating to trees to the site I would be happy to post them. Please let me know and I’ll give you specific directions. Thank you! Thanks for visiting my blog. Your project is great – good to know how many folks care about trees. Amazing and inspiring project. There is so much to be said about trees, from the literal to the spiritual. I coincidentally was just working on my recent series about, you guessed it, trees. There are no coincidences. I’d love to be involved. Please keep me posted. I will mail you two rounds tomorrow, such a great idea. Great! Thank you Caryl for you interest and participation! Thank you for your kind comments and post! It is an honor to be included in the exhibition. Please know too that the project is ongoing. Warm wishes!